A function is block of code which is used to perform a particular task, for example let’s say you are writing a large C++ program and in that program you want to do a particular task several number of times, like displaying value from 1 to 10, in order to do that you have to write few lines of code and you need to repeat these lines every time you display values. Another way of doing this is that you write these lines inside a function and call that function every time you want to display values. This would make you code simple, readable and reusable. Let’s take a simple example to understand this concept. The same program can be written like this: Well, I am writing this program to let you understand an important term regarding functions, which is function declaration. Lets see the program first and then at the end of it we will discuss function declaration, definition and calling of function. Function Declaration: You have seen that I have written the same program in two ways, in the first program I didn’t have any function declaration and in the second program I have function declaration at the beginning of the program. The thing is that when you define the function before the main() function in your program then you don’t need to do function declaration but if you are writing your function after the main() function like we did in the second program then you need to declare the function first, else you will get compilation error. Note: While providing parameter_list you can avoid the parameter names, just like I did in the above example. I have given int sum(int,int); instead of int sum(int num1,int num2);. Function definition: Writing the full body of function is known as defining a function. Built-in functions are also known as library functions. We need not to declare and define these functions as they are already written in the C++ libraries such as iostream, cmath etc. We can directly call them when we need. Here we are using built-in function pow(x,y) which is x to the power y. This function is declared in cmath header file so we have included the file in our program using #include directive. 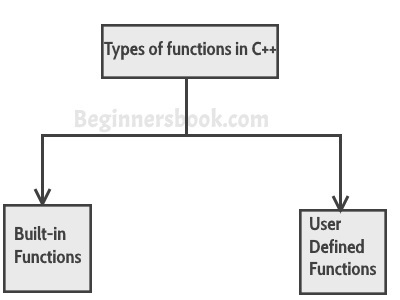 We have already seen user-defined functions, the example we have given at the beginning of this tutorial is an example of user-defined function. 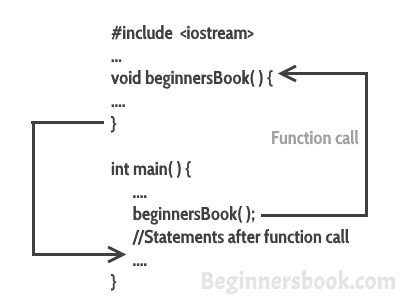 The functions that we declare and write in our programs are user-defined functions. Lets see another example of user-defined functions.